Put the steamed rice into the Bibimbap bowl. Add sesame oil and Gochujang to the rice and vegetables. Mix all the ingredients using your spoon or chopsticks. Best served with side dishes and soup. The hot pepper paste is spicy and can be added as desired. With a little of this and a little of that, my bibimbap was prepared. 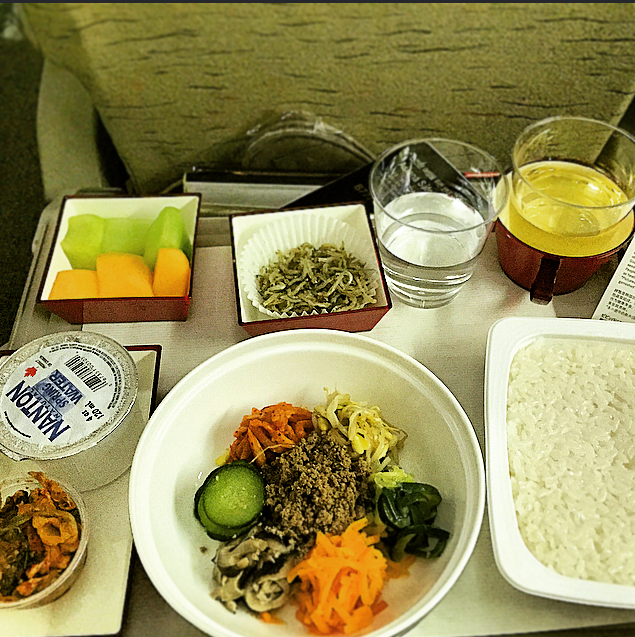 My on-board meal was a solid introduction to the most widely known Korean dish. Mid-way through my bibimbap, as per my instructions, I began to try out my sides. 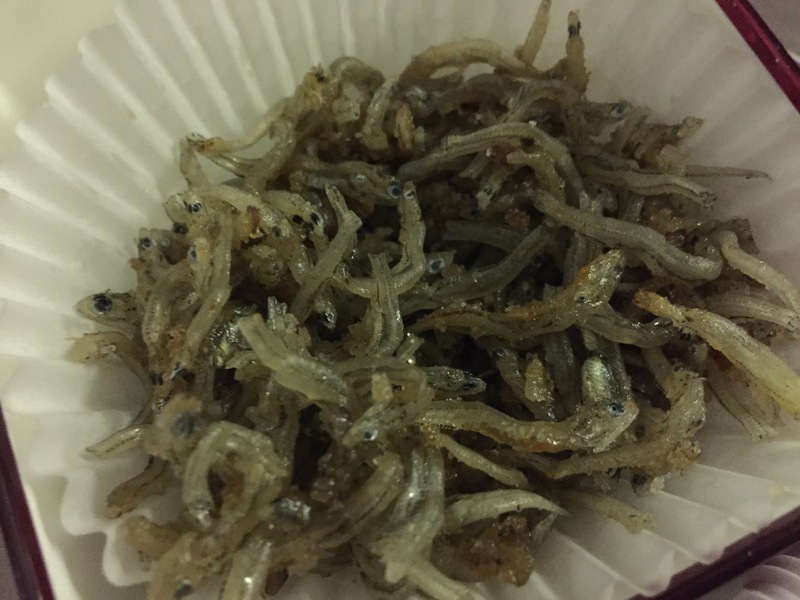 The first dish I picked up was filled with dark thin flaky crisps. Not having one clue what they were, I dove right in. The moment my chopsticks touched my tongue I realized this was not what my body was calling for in the wee hours of the morning. I quickly took a swig of water and pulled my glasses out from the seat compartment in front of me, I slid them on my nose to examine the bowl. It was exactly as it tasted- small, boney and very fishy, fish. It was at this point that I became wildly excited and overly curious for what would end up on the table in front of me for the week that lie ahead. 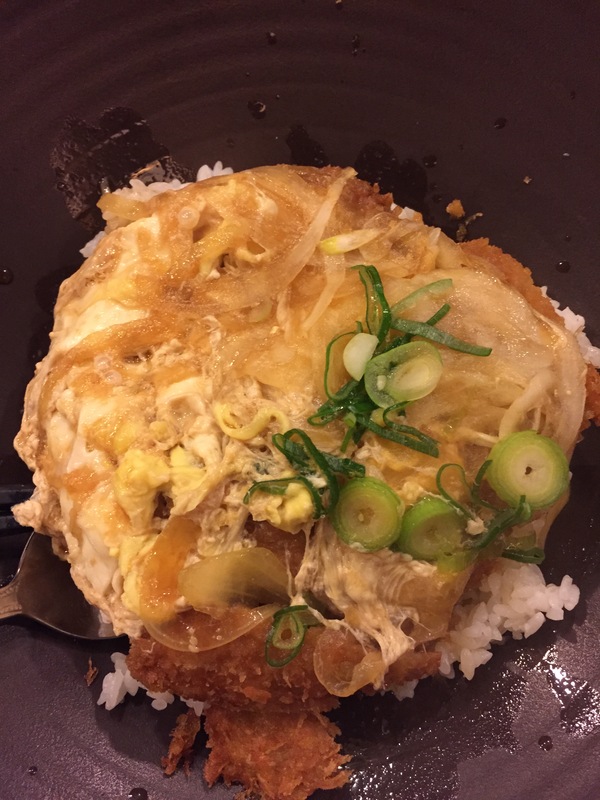 Prior to traveling to Seoul I had no idea what to expect food-wise. 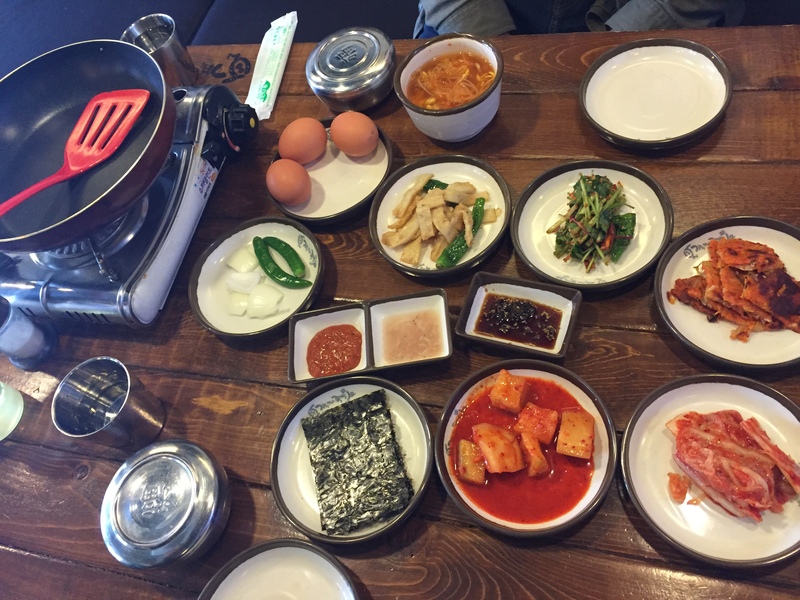 I had read about all of the different signature dishes to try while I was in Korea but knowing no Korean was unsure how I would be able to order anything. 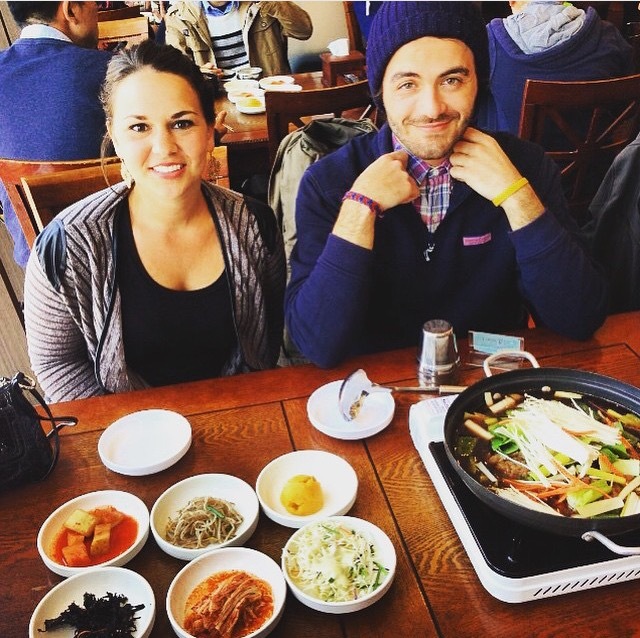 However, throughout my week in Korea I learned more about the Korean food culture and traditions than I ever expected. There is no one signature Korean meal or taste. Korean food has more flavors, varieties, textures and temperature variation than any cuisine I have ever been exposed to. 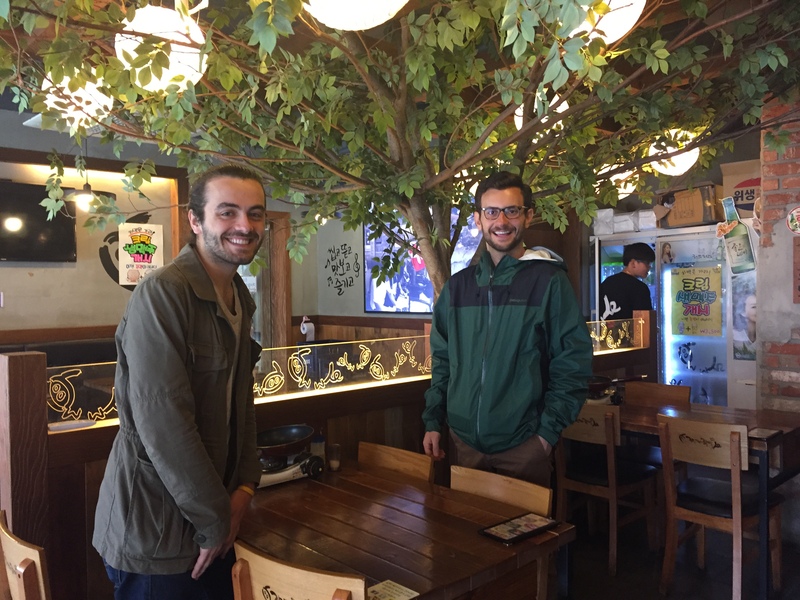 I have no idea what I actually ate while I was in Korea, the majority of our meals were picked out by a strategic method of staring at a menu and pointing to what looked good or by befriending local Koreans who would kindly recommend dishes to us. Although I don’t know the names of what I ate, or even what was in each meal, I feel it is important to share because each dish was incredible unique and divine. Not one dish resembled another thing that we ate for the entire rest of the week, we couldn’t even repeat order if we wanted too! Each restaurant had a personality, had a signature, had a recommended item. Soups, veal, vegetables, fishes, spicy, mild, hot and cold. All so different and so delicious. To know Korea is to know kimchi. As Arber likes to say, he is a “kimchi kinda girl in a kimchi kinda world.” Although kimchi is universal across Korea every restaurant has a unique spin and preparation of their kimchi. Kimchi is a kind of cabbage and in 2006, U.S. health magazine selected kimchi to be one of the five healthiest foods on earth. 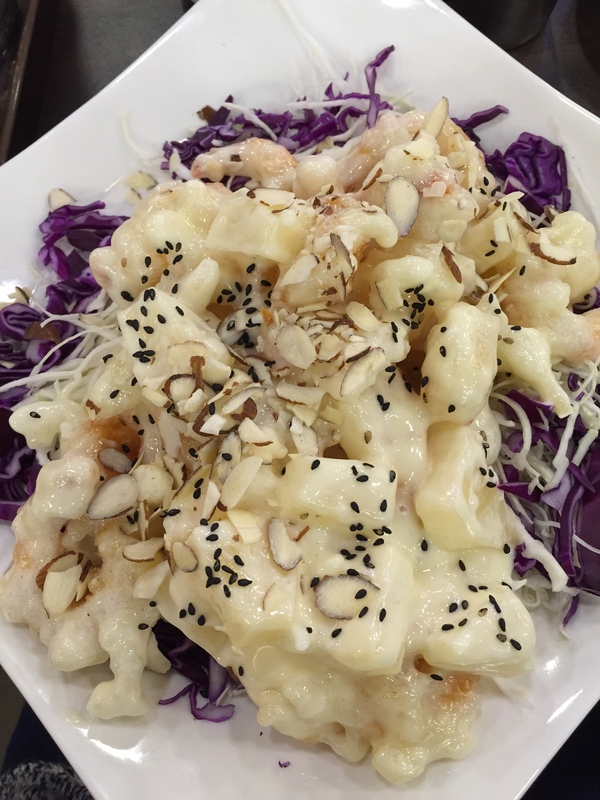 When in Seoul, be sure to visit the Kimchi Field Museum to learn more about the different flavors that go into making this phenomenal dish! 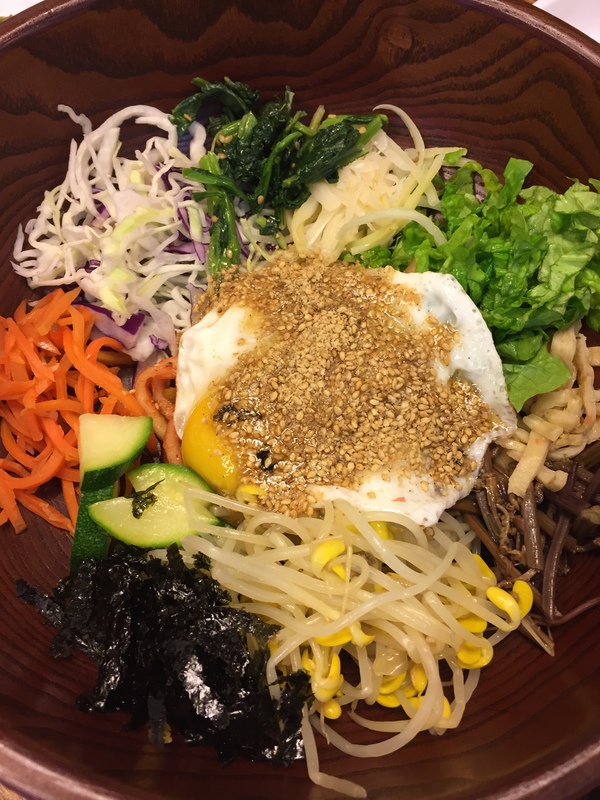 Bimimbap is a dish of cooked rice served with an assortment of seasonal vegetables, egg, and minced raw beef, among other ingredients. 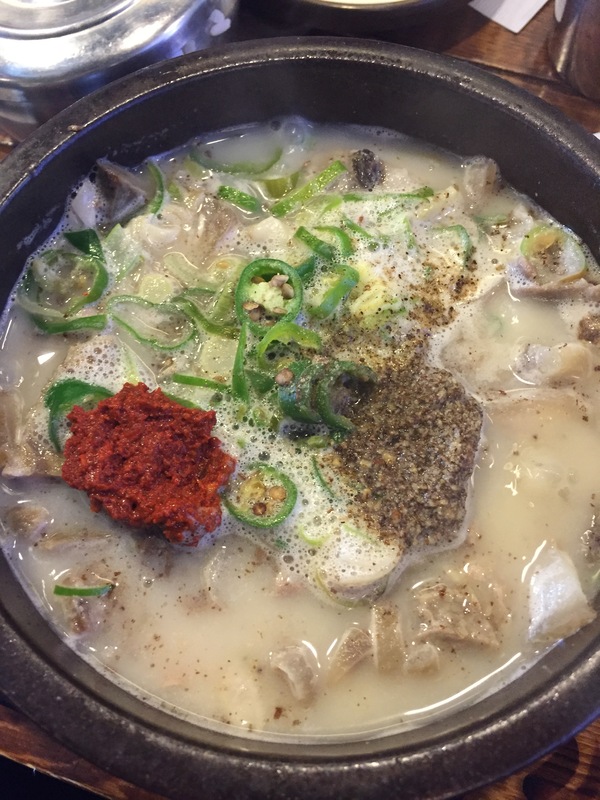 It is one of the three most representative dishes of Korean cuisine along with kimchi and bulgogi. Yes, it is as delicious as it sounds, and more wide-spread than you would think. It’s time to show off your grillin’ skills! The grill is on the center of your table and is waiting to see what you are made of. Pork, lamb, skirt steak- the options are endless. Soju is Korea’s most popular alcoholic beverage. In Korea, Soju is cheaper than water. 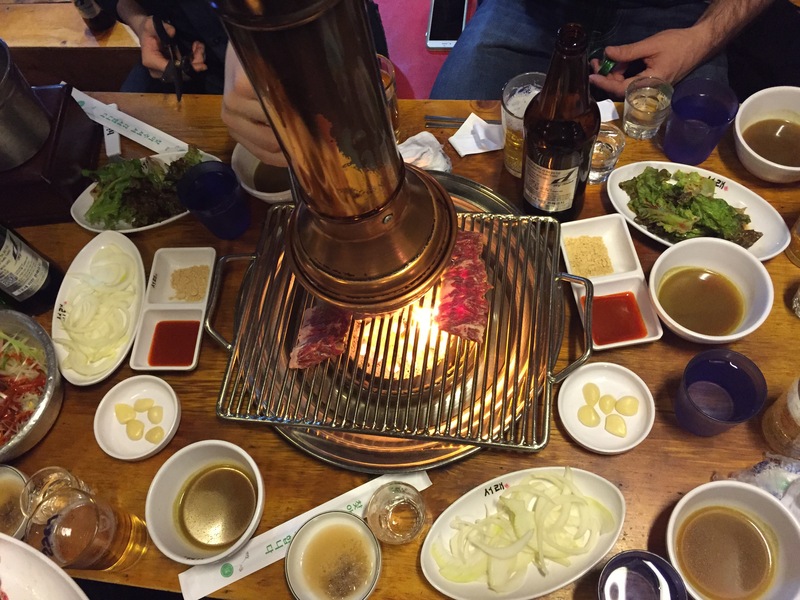 It is usually consumed neat and you will often see tables doing shots of Soju throughout the entire meal. Soju is clear and colorless but is certainly not flavorless! It is rice based alcohol and contains 16.7% to 45% of alcohol by volume. Beware! As in most Asian cultures, respecting your elders is very important in Korean culture. Wait for your elders to sit, wait for them to pick up their chopsticks, and wait for them to finish before you do any of those. They should be the first to sit, the first to begin eating, they also signal when the meal is over and when you should put your spoon and chopsticks down. Communal servings, it’s the name of the game. Koreans believe sharing food from one dish makes a relationship stronger. 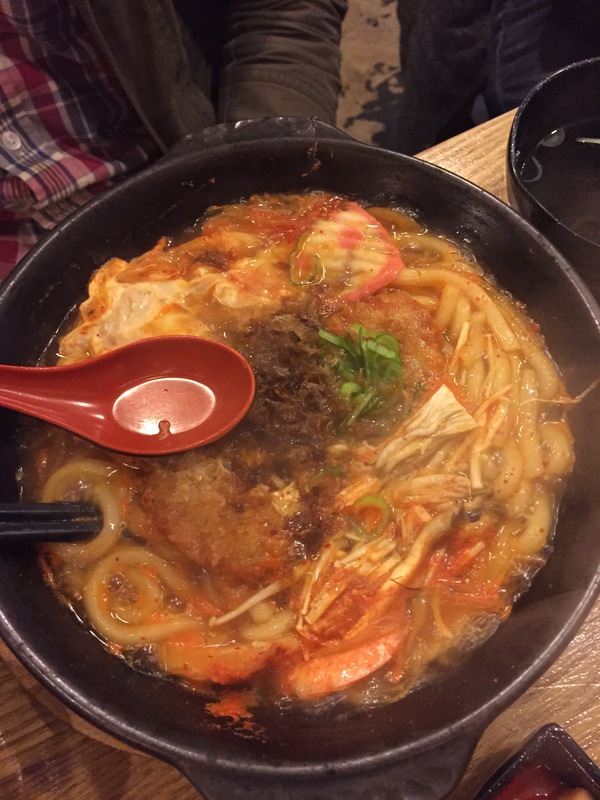 So sides, soups and even individual dishes should be eaten and shared with the entire group. You will not be given an individual side dish to take your portion so get comfortable now with the “what’s mine is yours” mentality because this is certainly the Korean mindset. The essentials: chopsticks, a spoon & your rice bowl. In Korean culture you will always be given flat, stainless steel chopsticks, a spoon and a metal bowl of rice. The chopsticks are shorter in length than Chinese chopsticks but longer than Japanese chopsticks. The decoration around the grip is very ornate and unique to each restaurant. This is very different from most other Asian cultures. 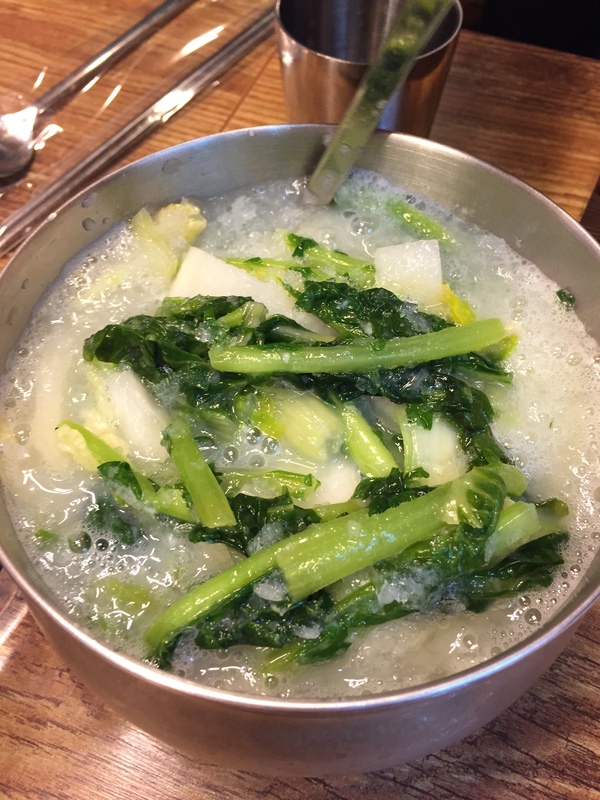 The flat chopsticks are much more difficult to eat with and because a lot of Korean dishes are broth based, it is recommended that you use your spoon when mixing different flavors and eating meals. At the end of the meal, be sure to leave no trace of food on your chopsticks or spoon and return them to their position alongside your plate at the table. 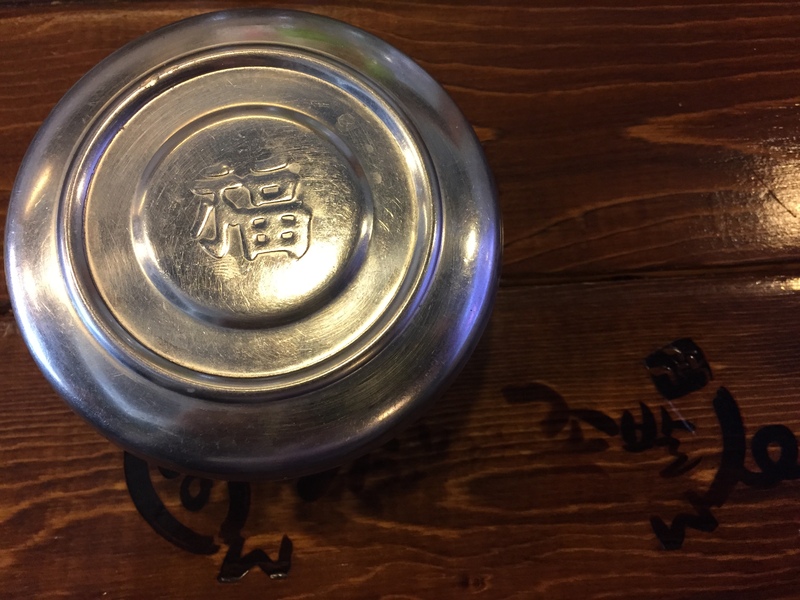 Rice is served in a metal bowl with a lid on it. Lift it up, shake it around and pour it on whatever you’d like! It comes out perfectly in a rounded blob and is ready to be crushed and mixed. The table: home to everything you could possibly need. Napkins, chopsticks, spoons, wipes, water, cups, menus and even scissors (scissors are used to cut meats and vegetables). Are usually all already at the table. Whether it be on the actual table or in a draw underneath the table it is all there. So do not fret if you food is served and you do not have utensils. Look around, maybe even underneath the table, and it will be there for your convenience. 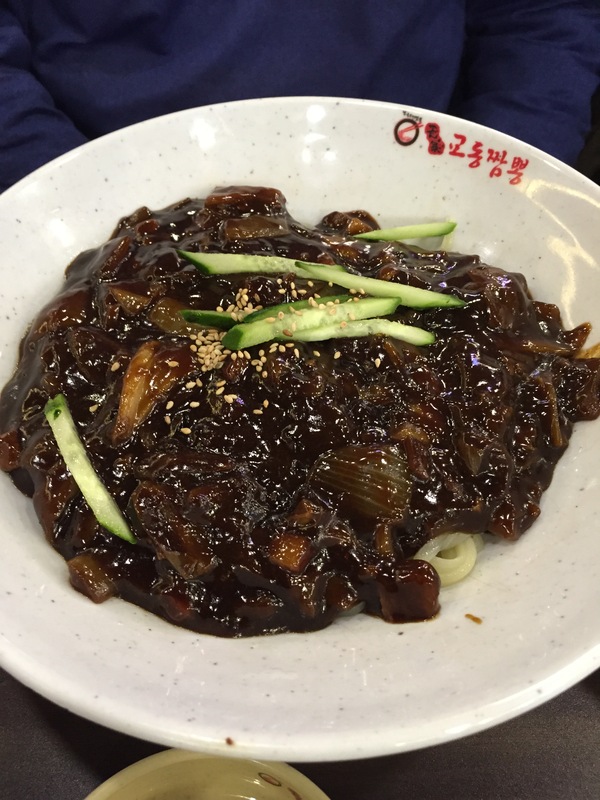 All Korean meals are served with an abundance of side dishes. 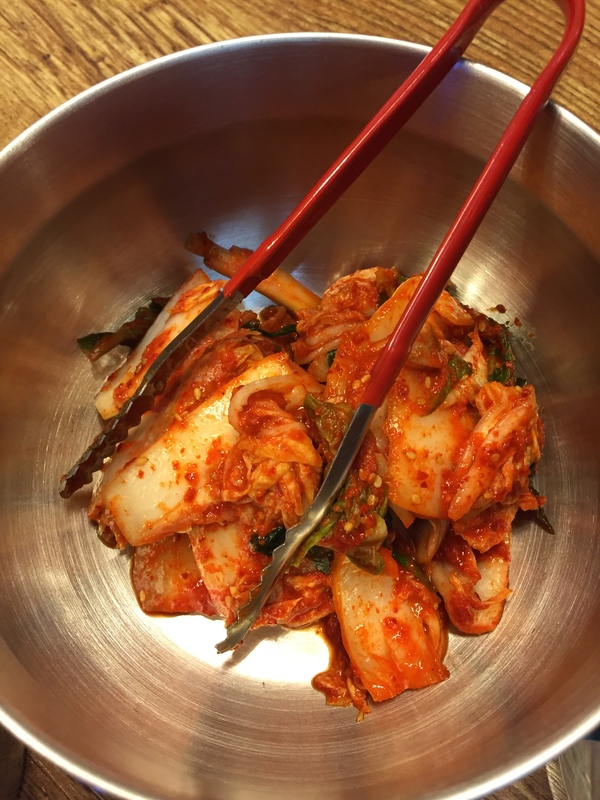 Kimchi is always included in the sides but you can be given from six to ten side dishes as soon as you sit down. Warning: do not fill up and do not eat all of them immediately because they should be used in conjunction with your meal to add flavor and dynamic to what you will be served later on in the meal. Your mouth is your mixing bowl. As I have already said, Korean food has some of the most flavorful dishes I have ever tasted. A lot of dishes are served individually and are meant to be mixed with other items on the table. Wrapping meats in seaweed, dipping vegetables in red bean paste or mixing broths with rice are all common acts. There is no right or wrong. Have fun, mix and match, play around and have some fun at the dinner table. Use two hands and do not pour your own drink! 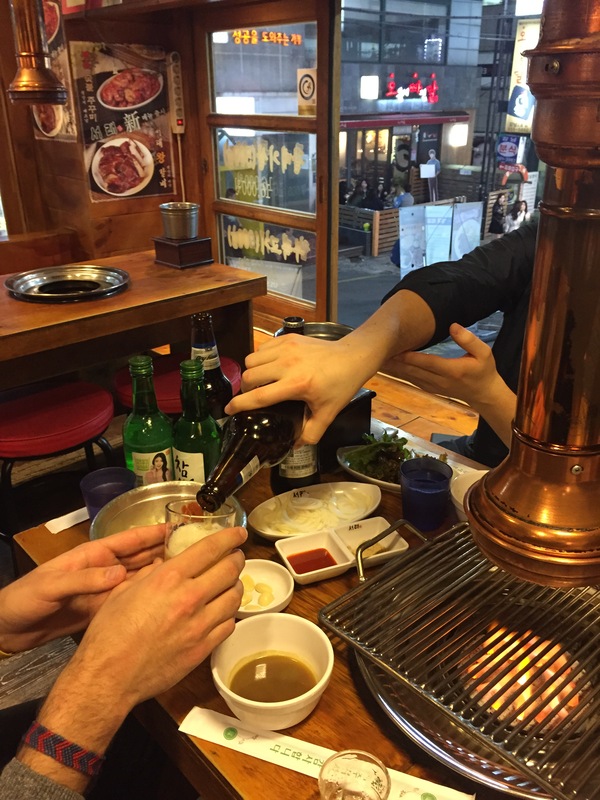 In Korean culture, when pouring a drink, receiving a drink or passing and receiving a side dish, you should always use two hands. This shows an element of respect and care. This signifies that you are not just making the rounds of passing dishes around the table but you are taking the appropriate care and respect that this meal deserves. You should also never pour your own drink. The most senior person at the table should be served first. When accepting a drink you should use both hands to receive the pour and when pouring. 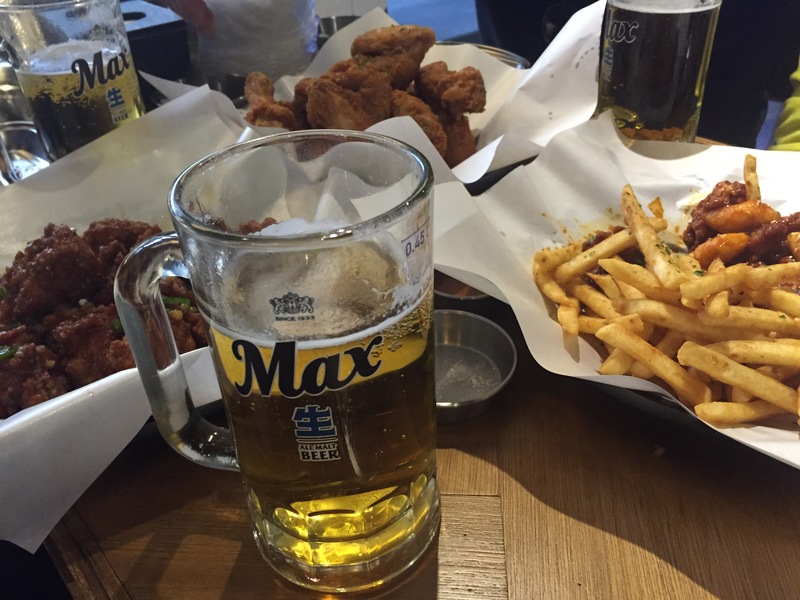 Drinking is a very important aspect of doing business in Korea. Glasses should never be left empty until the end of the meal. When receiving, put each hand on both sides of the glass. When pouring, use one hand and put the other hand on the underside of your wrist. Always pour others drinks first and have them return the favor by pouring yours. In Korea it is not common to split the bill, actually don’t split the bill. Meals, drinks, coffee, etc are all bought in rounds. Dining and drinking is a social sport, I’ll get this one, you get the next. Usually the older member of the group will buy the first round and then each person in the group will buy a following round whether it be of drinks, coffee or even a second meal! At Korean restaurants you will not be given a bill. When you have finished your meal and you are ready to leave, simply stand up, go over to the kiosk and they will ring you up right there and then. Sign and be on your way. Off for round two! Lastly, and most importantly, ENJOY! Don’t be afraid to try new things and explore!